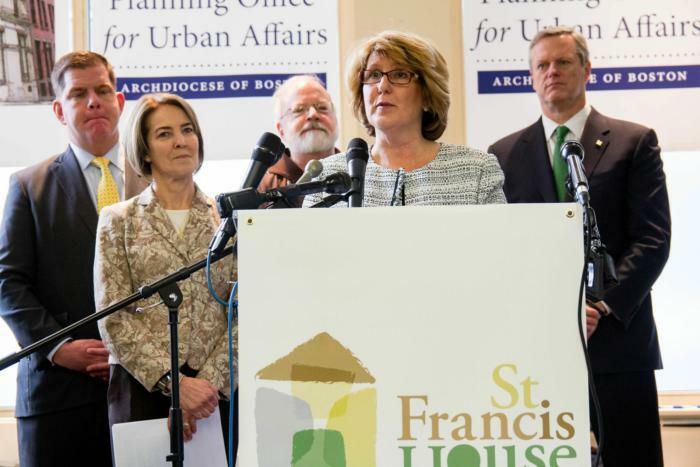 BOSTON -- The Planning Office for Urban Affairs (POUA), a social justice ministry of the Archdiocese of Boston, and St. Francis House broke ground on The Union, an upcoming affordable housing redevelopment in downtown Boston, on Jan. 16 during a ceremony attended by leaders in private and government sectors. Cardinal Seán P. O'Malley, Gov. Charlie Baker, Boston Mayor Martin J. Walsh, POUA President Lisa Alberghini, President and CEO of St. Francis House Karen LaFrazia, and the Massachusetts President of Bank of America Miceal Chamberlain were among those who attended and spoke at the ceremony. In opening remarks at the groundbreaking ceremony, Alberghini said the upcoming housing units will "bring stability, opportunity, independence, and hope for the future." The project is both "important and exciting," she said. "It's important because The Union is a model for how non-profits with different skills can come together to provide homes for the most vulnerable. It's exciting because it's a vision of a community of diversity, where people of all backgrounds can live in the downtown." Located at 48 Boylston Street in Boston, across the street from St. Francis House, the largest day shelter in the Commonwealth, The Union property was built in 1875 by the Boston Young Men's Christian Union (BYMCU), and was operated by the organization for over 150 years. In 2016, POUA and St. Francis House announced a partnership with plans to redevelop the property into 46 units of affordable housing, with 26 units reserved for people who are currently homeless or have been homeless, and 20 units for residents with incomes at or below $43,440. Additionally, when completed, St. Francis House will relocate its administrative offices to the development and will establish a business venture on the first floor of the building to help provide job opportunities for the people they serve. Cardinal O'Malley, in a statement before offering an opening prayer, said homelessness is "one of the most urgent things that we are dealing with in our modern society." He thanked those in attendance for their support, adding that "hopefully, together we will find more and more ways to help the homeless so that we won't have homeless people in our streets." Plaques bearing a rendering of property were given by Cardinal O'Malley to those who helped pave the way for The Union, acknowledging both those in the private and public sectors. In his remarks, Gov. Baker said he and his administration are "pleased" to be a part of the project, and "can't wait to see" the finished development. "I'm really pleased to be here to celebrate this step in what I'm sure will be an ongoing series of steps and successes," he said. "Nothing is more destabilizing to a community and a human life than homelessness and human poverty, and nothing does more to rebuild a life than ensuring that every person can have a home and live with dignity," she said.